The Oiled Cone pendant lamp from Leitmotiv is a real eye cather, both above the dining table and for example in the kitchen. Beautiful on its own, or in a series next to each other. 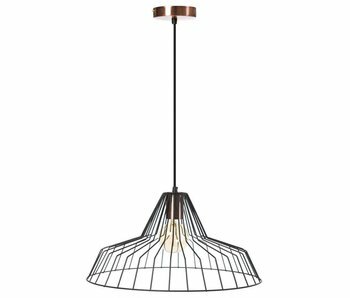 The Oiled Cone pendant lamp from Leitmotiv is a real eye cather, both above the dining table and for example in the kitchen. Beautiful on its own, or in a series next to each other. Source for 1 lamp with an E27 socket, max. 40 watt (not included). 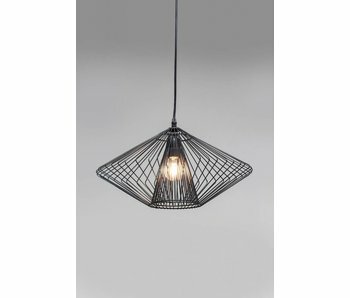 Modern, stylish ceiling lamp with black frame in thick, hardened metal wire. The socket and ceiling cap are copper-coloured, giving it a subtle accent. Pendant lamp with round shapes in a minimalist design that is reminiscent of a big water drop. The bamboo material gives the lamp a natural look. 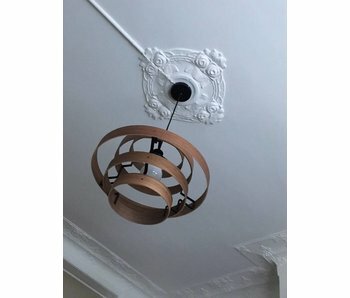 Beautiful retro ceiling lamp made of high-quality wood and consisting of 5 rings that seem to float around the lightbulb, resulting in extra atmosphere. 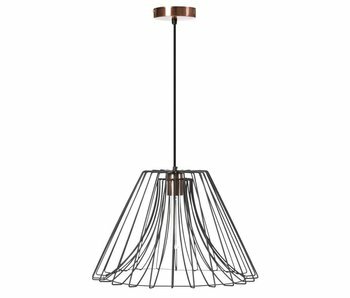 Modern, stylish ceiling lamp with black frame and copper colored lamp holder and ceiling cap.